Manchester United have revealed Carlos Tevez has badly bruised his ankle after he was carried off in their 1-0 win over Birmingham on New Year's Day. The striker was carried off the pitch in the 71st minute and is a major doubt for United's FA Cup third round match against Aston Villa on Saturday. 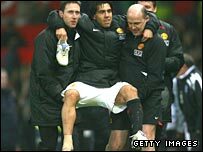 "Nothing is broken, Carlos Tevez has just got a badly bruised right ankle," said a club spokesman. The Argentine had scored United's winning goal in the 25th minute. Tevez's goal ensured the Premier League champions began 2008 with a victory, but manager Sir Alex Ferguson compared the Old Trafford atmosphere to a "funeral". Ferguson noticed the lack of voice from the 75,459 crowd after watching the match from the directors' box as part of a two-match touchline ban. "That was the quietest I have heard the crowd, it was like a funeral," he said. His comments come seven years after Roy Keane famously dubbed the Old Trafford crowd as the "prawn sandwich brigade". "The players need the crowd sometimes but the atmosphere inside the ground wasn't good," said the Scot. "There are some situations when we need them to get behind us and give us a lift." Former Manchester United captain Keane made headlines in 2000 when he laid into sections of the Old Trafford crowd, claiming they couldn't "spell 'football', never mind understand it". He later insisted that he was referring to the crowd in general, not just United's corporate fans. And Ferguson has complained on previous occasions about the lack of atmosphere at Old Trafford. "I think there have been days like this in the past," said the Scot. "It happened some years ago, when we were dominant. "The crowd come to be entertained but sometimes we need them to help us get the right kind of performance."